Last week, the Zionist Organization of America issued a press release expressing its shock that President Barack Obama omitted Israel in his list of countries suffering from terrorist attacks. ZOA was appalled by the omission. The ZOA press release also referenced a 2008 speech Obama delivered as a candidate when he mentioned six cities plagued by terrorism but failed to include an Israeli city. I thought the ZOA's statement was unnecessary. It is clear that President Obama was using alliteration in his speech and sought to provide some examples of where terrorism has occurred. Perhaps if terrorism were more prevalent in a major world city like Johannesburg, he could have included "Jerusalem or Johannesburg" in his speech. The President wasn't giving priority to these world cities over any other location where terrorism has occurred, he was merely stating that we should honor and celebrate the resilience of people everywhere. Just as Chicago would be included if we say "in New York or LA," so too Jerusalem and Tel Aviv are included when the President says "Lahore or London". So, I didn't think the ZOA's rant was necessary. I do, however, raise my eyebrows at the NY Times' decision to not issue an email news alert about yesterday's storming of Israel's Egyptian Embassy by thousands of protesters in Cairo and the necessary evacuation of its diplomats by Israeli military jets. 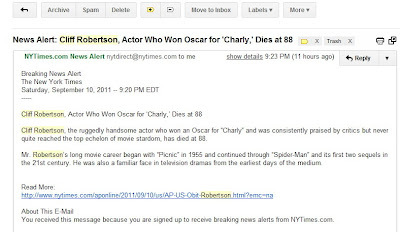 I've been receiving email news alerts from the NY Times for many years. Most of the time they are legitimately "breaking news" stories. Sometimes the news alerts refer to breaking political news and sometimes they let you know if a major sports milestone occurred. Oftentimes they alert us if a notable person has died. 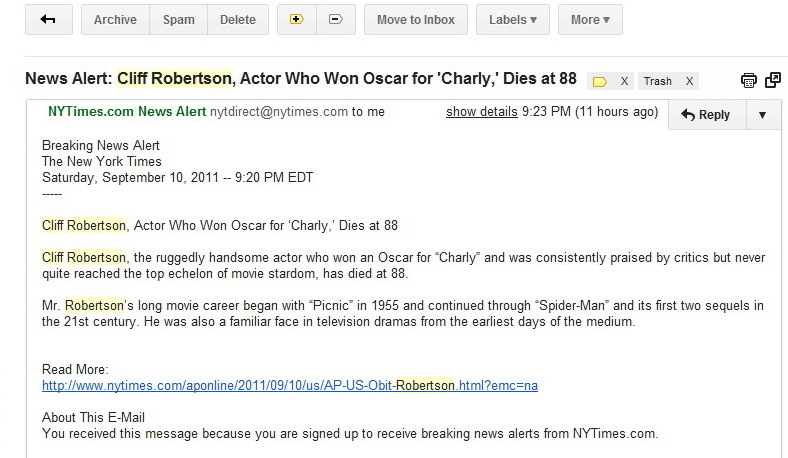 I was surprised last night after Shabbat when the only news alert I saw in my email inbox from the NY Times let me know that actor Cliff Robertson had died. Who was Cliff Robertson? Exactly! Even though over 80 personnel and family members of Israel's embassy in Cairo had to be saved in an emergency rescue operation after violent riots erupted there, the NY Times felt that the only "breaking news" that had to conveyed to its news alert subscribers was that a little known actor had died. In the alert, the Times even described Robertson as an actor who "never quite reached the top echelon of movie stardom." I don't think President Obama deserves to be attacked for neglecting to include an Israeli city in his brief listing of world cities where terrorism occurs (everyone knows Israel has had her share of terrorist attacks), I do think it is curious that the NY Times is so misguided when deciding what news actually deserves an email news alert. Surely you wouldn't say that Israel's omission from the founding members list of Obama's Global Counterterrorism Forum is simply an instance of lightening striking the same place twice?